If there is one team causing a few ruffles in the on going Liga 2 second round it is totally unfancied Persibat Batang from the north coast of Java. Situated on the pantura, that narrow coastal highway that is in the news once a year for his gridlock as people head home at the end of Ramadhan, Batang lies between the larger cities of Pekalongan and Semarang and in football terms is very much in their shadow despite finishing runners up in the old third tier back in 2014. That has changed this season. Placed in the same group as PSS, PSCS, PSGC, Persibas, Persip and Persijap not many people would have fancied their chances of getting out of the first round and with PSS dominating many looked beyond Persibat for the second side to qualify. Both PSCS and PSGC have invested heavily in recent years while Persijap boast the history and experience of playing at the top level. Persibat lack all that but they have managed to overcome a coach quitting early in the campaign to secure that crucial second round place after defeating Persibanggga in the last game of the first round and go through on goal difference ahead of PSCS. With Daniel Roekito on board as new coach, he led Persik to their Liga Indonesia title back in 2006, Persibat were ready for their shock bid for promotion and a surprise 3-0 win away to Persijap in their penultimate game served notice Roekito's team weren't just a home side. The second round saw them drawn with Persita, neighbours PSIS and heavily fancied PSMS and they started well with a third straight win on the road, triumphing 2-1 against Persita. A 1-1 draw at home to PSIS followed before Persibat edged PSMS 1-0. They lost the return game 2-1 in Medan and today, sitting in second place three points behind leaders PSIS, host Persita. PSMS's victory over Persibat has given the Medan side hope they can recover from a slow start in the second round but they face group leaders PSIS today in a tough challenge. At least they can bank on home town support as they look to end their barren years but it looks like everything will come down to the last round of fixtures next week when Persibat's fate will be decided when they travel to Semarang to play the leaders. There is a refreshing transparency about this small football club. After most of their home games they post on social media the attendance and the gate receipts as well as listing their expenses. For example their second game of the second round stage saw 6,652 spectators watch them play PSMS while 7,369 saw them take on local rivals PSIS. Oh well. 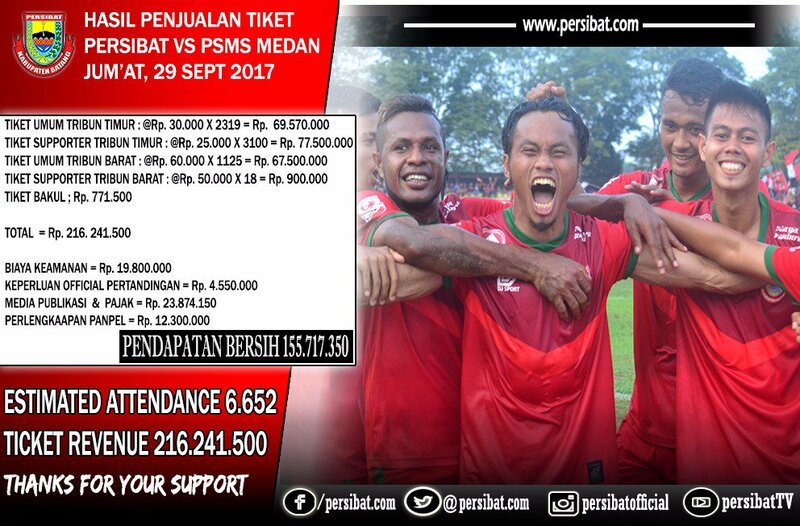 PSMS came from behind to defeat PSIS in Medan while Persibat surprisingly went down at home to the bottom side. Everything now hinges on the final round of fixtures next week.